The Volkswagen Atlas Cross Sport unveiled this week at the New York International Auto Show may be officially called a concept, it seems to us like it’s very close to production. If this is the case, that means that a model with sportier lines and powerful hybrid technology could well find its way into Volkswagen’s lineup very soon. The Volkswagen Atlas Cross Sport is basically a five-door Volkswagen Atlas in prototype guise. It may offer fewer seats, but the new Atlas Cross Sport is nevertheless a showstopper with its sleeker and sportier design that gives it a bold, yet refined look. We really like the LED lights that cross the entire front of the concept. The new Volkswagen Atlas Cross Sport, which is 190 millimeters shorter, would really stand out on the road. Meanwhile, it features two powertrains that, like the rest of the model, seem quite production-ready to us. Indeed, Volkswagen had the good idea of ​​pairing the 3.6-liter V6 engine with two electric motors for a total output of 355 horsepower. Average fuel consumption is only 11.0 liters per 100 kilometers, according to preliminary information from Volkswagen. That’s not bad at all when you consider that the Volkswagen Atlas Cross Sport will be able to reach 100 km/h in just 5.4 seconds. With an 18 kWh battery, the Atlas Cross Sport can also travel up to 42 kilometers in 100% electric mode. All of this sounds very good to us. If we are fairly convinced that the Volkswagen Atlas Cross Sport will eventually make it to market, it is because Volkswagen has bothered to add a second engine, a hybrid version that is not rechargeable but still offers a 2.0 kWh battery and a total of 310 horsepower. This engine can reach 100 km/h in just 6.5 seconds. In addition, Volkswagen says that 4Motion AWD will be available. Nothing is confirmed yet, but if Volkswagen decides to produce the Atlas Cross Sport, we'll probably see it early in 2019. 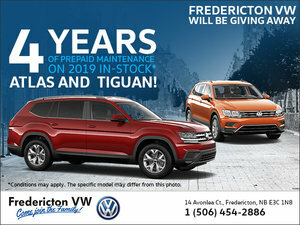 Come and see us today at Fredericton VW to find out more about the 2018 Volkswagen Atlas!